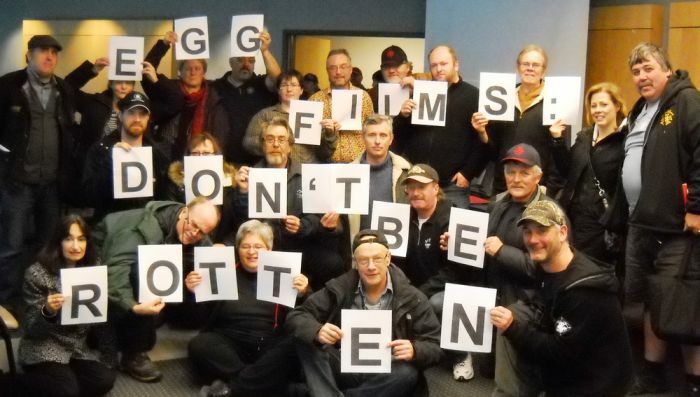 In March Egg Studios locked out 290 freelance film technicians, members of IATSE Local 849 after failing to reach a second collective agreement. Sébastien Labelle wrote a personal response originally posted on Facebook after being questioned about his support for IATSE. Sébastien is a self-employed actor and member of ACTRA. He is also VP (Culture & Mayworks) at the Halifax-Dartmouth & District Labour Council, a member of Solidarity Halifax and a former union organizer with the Service Employees International Union Local 2.
believe in the right of workers to have representation at work and a say in determining their working conditions. Employers should not be the sole dictators of our economic circumstances, they should be obligated to consult and negotiate with the people they employ through the organizations that represent their collective interest in order to level the power imbalance between employers and employees. This is especially important in the case of freelance/contract work where workers are particularly vulnerable to the whims of employers. More and more, our economy is trending toward precarious contract work where job security is very low and the ability to patch up a sustainable stream of income that provides through bad circumstances and can support families is extremely difficult. IATSE, like all unions, is actively working to buck that trend to the benefit of all workers and of our economy as a whole. Being myself a worker in an industry with very low job security (increasingly so as of this summer), it is to my benefit to assist others achieve fair and livable working conditions. If the floor and ceiling of working conditions in my industry are raised, I then can expect my own conditions to improve over time. The reverse is also true. But more to the point in this particular case – Egg Films has a legal obligation to negotiate with IATSE 849. Whatever you might think of how it happened, the union certification (an extremely difficult process) *IS* in effect. Period. The validity of the certification has been upheld in trial after trial up to the Supreme Court of Canada (hardly a bastion of leftist politics). Pretending that the certification isn’t valid is petty and harmful. It is also dragging friends and colleagues in an industry already suffering from high stress into a prolonged unnecessary strife. Egg Films’ suggestion that the impasse is IATSE’s fault is disingenuous. This is a lockout. The employer has locked out the contract workers from working for them. This is the employer’s decision, not the union’s. It is also up to the employer to end the lockout and return to the bargaining table. Instead of collaboratively crafting improved working conditions for workers it employs, Egg Films (Atlantic Canada’s largest TV commercial producer, with annual revenue in the millions) has instead chosen to spend outrageous amounts of money and resources into futile legal battles and misleading PR campaigns. The fact that Egg Films is shamelessly attempting to co-opt union symbols and slogans to portray itself as the victim in a union-busting campaign is despicable. I have no doubt that Egg Films’ full-time employees with secure positions and benefits along with pension, EI and WCB contributions are very content (I would be too!). But these are not the workers who are locked out. Those who are locked out are not in the photos peppered with smiles that Egg Films gleefully shares on FB. Those workers have to patch an income while working for numerous employers over the course of a year, every time through short term contracts that often don’t offer contributions to pensions, EI and WCB, leaving them in constant financial insecurity. As an ACTRA member, I get negotiated standards for working conditions and contributions when on contract. These workers also deserve the same ability to negotiate their own terms, and they deserve to have their union rights respected. If employers are the motors of our economy like they claim to be, then they have a social obligation to foster an economy that will provide safe, secure and livable working conditions for all those who participate in the economy. #NSFilmJobs isn’t good enough if people can’t make a stable living off of them. 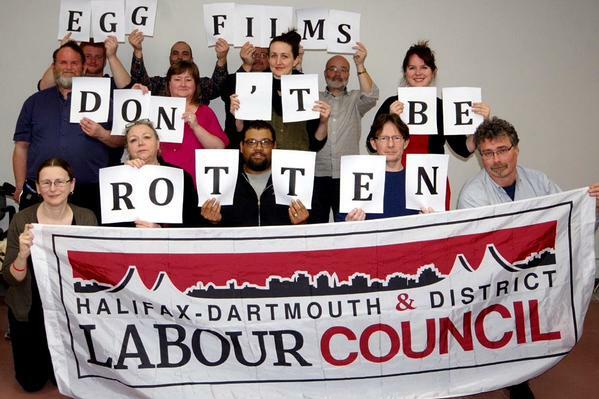 Egg Films needs to end the lock out, get back to the negotiating table and help us all lift standards in our industry.